> NO HORSES ON RAIL BEDS. > Proof of Negative Coggins will be requested as is required by Texas law. > Trails are open subject to conditions. Call 903-569-6183 to confirm. > For the safety of all, observe and abide by all signage and directions. > If trails are closed due to weather or maintenance, please honor temporary signs. > Horses and riders must remain within designated areas while loading and unloading. > Stay on designated trails. Do not create new trails or diversions. > DO NOT ride on trails restricted to walking, such as railroad bed. > Horses must not be tethered to trees, shrubs, or other than designated park structures. > Please leave the Preserve better than you found it. Use litter barrels. Or pack it in and pack it out. > DOGS must be on leash. Failure to observe these guidelines will be cause for removal from the Preserve and a possible fine. Please have someone in your group with a cell phone. Call 911 in the event of an emergency. For assistance, call 903-569-6183. Electricity, water and restrooms are available at the trail head (The DERBY) and at the Pavilion. SHOWERS are available at The DERBY. The trails are easily damaged when used improperly due to too much traffic, weather or abuse. Our goal is to maintain high quality equestrian, biking and walking trails for generations to come. Please assist us in that goal. The trails are designed to be shared by bikers, walkers, and other outdoor persons. Please show courtesy at all times. 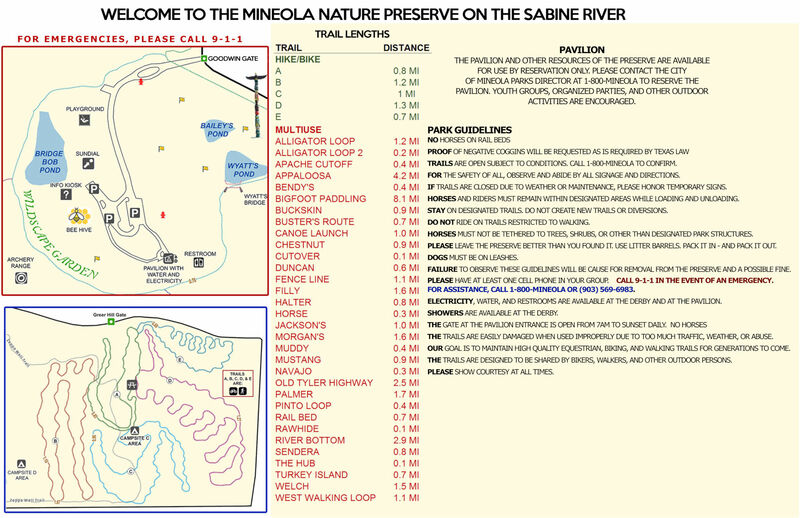 The PAVILION and other resources of the Mineola Nature Preserve on the Sabine River are available for use by reservation. Please contact the City of Mineola Parks Director at 903-569-6183 to reserve the Pavilion. Youth groups, organized parties, and other outdoor activities are encouraged. As the Preserve continues to be developed, additional facilities will be available for use. 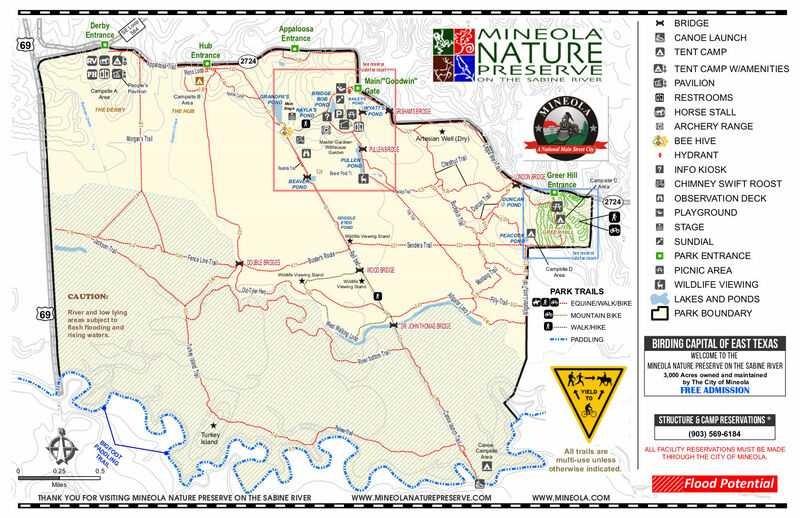 The trails and facilities were funded primarily from grants from Texas Parks and Wildlife and the City of Mineola. Maintenance and improvements are provided from user fees. 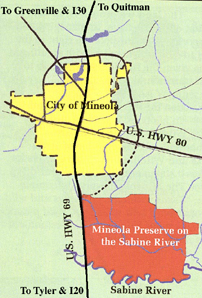 The City of Mineola is responsible for the management of The Mineola Nature Preserve on the Sabine River. DONATIONS ARE WELCOME.